The NWTC-1 a low cost temperature controller for high volume fixed setpoint applications. The NWTC-1 is factory set for your setpoint and hysteresis but can be adjusted in the field. 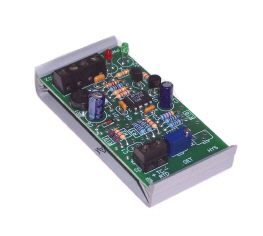 The NWTC-1 provides an SSR drive output, accepts either thermocouple or RTD and operates from 24VAC/DC power. Minimum orders of 100 pieces apply to waive the setup charges for your temperature range and sensor. Control transformer is sold separately. © 2019 NuWave Technologies, Inc.